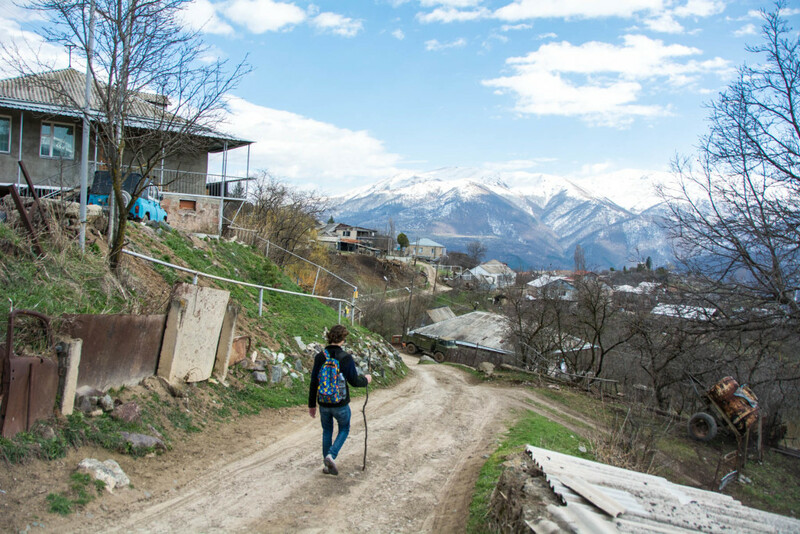 A quick guide on hiking from Dilijan to Jukhtak monastery in Armenia. Includes information on how to get to Dijilan and where to stay. Dilijan, sometimes affectionately referred to as “Little Switzerland” by the locals, is a resort town in northeastern Armenia. At 1500 meters (4900 feet), it’s beautifully perched between several mountains–an ideal place for a hiking adventure. There are several monasteries and villages within walking distance of the town. 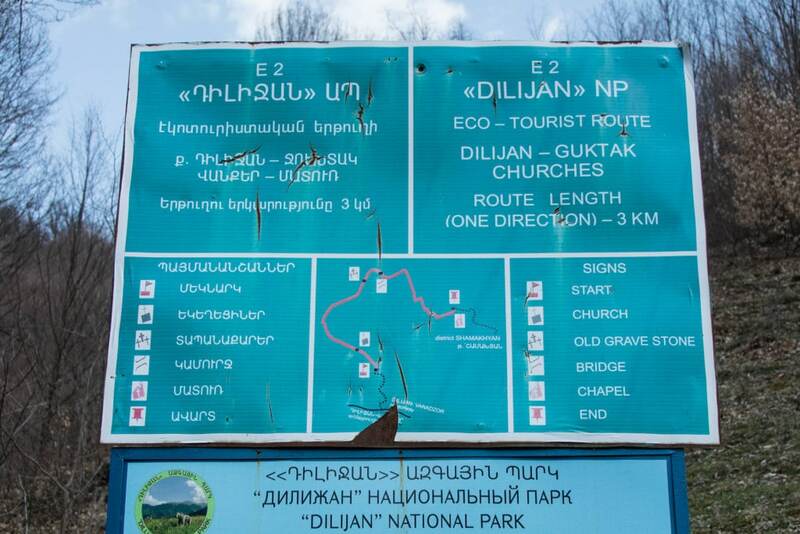 Dilijan also borders Dilijan National Park, which has a multitude of hiking options. Below you can find a guide on how to hike to Jukhtak monastery, continue to a village, then head back to Dilijan. To get to the park which houses the monastery, follow the main road to Vanadzor heading west. Go right once you encounter the sign shown below, then keep going straight along the road. After about an hour of walking along the main road of Dilijan, you’ll reach a small village and some abandoned buildings. From here you can enter Dilijan National Park, which houses the monastery. To get to the monastery, follow the road for about 10 more minutes. The monastery itself is nothing special, but the walk is pleasant and you can relax while taking in the natural surroundings. After following the road for a while, you’ll see this sign, which signifies the entrance to the park. Beyond the monastery, there are several dirt roads with many a fork, and we were not sure which one to take. Fortunately, there are spray painted arrows on a fallen stone column pointing in the right direction. (We initially went left for reasons unknown, and recommend you to just follow the arrows instead). The rest of the walk is very pleasant, albeit a bit muddy and steep at points. The trail passes a simple hilltop cemetery, another tiny hut that may or may not is considered a monastery, and ends in a village on the outskirts of Dilijan, on the highway between Dilijan and Vanadzor. Armenian bridges of dubious structural integrity. Only expert hikers need to apply. Luckily the world rewards us with stunning views wherever we go. Note: Beware of big dogs (with big teeth) along the way—not all dogs can be as friendly as the dogs that helped us in Mestia. Their bark is probably worse than their bite, but when the dog is as big as a small horse, we generally prefer to avoid finding out what their bites are like. To be fair, there are plenty of curiously friendly dogs too. The above-mentioned hike should take about three hours, although it took us six due to our refusal to follow directions. We threw in a little urban exploring on the way back for a healthy and well-balanced exploration. Dilijan is a popular holiday resort in Armenia. Expect prices to rise in high-season. For more information on hikes and other attractions, ask the people at your guesthouse. There are hourly marshrutky from Yerevan’s northern bus station (hyusisayin avtokayaran). They go between 10:00 and 16:00 and costs 1000 AMD per person. Marshrutka also leave from Vanadzor for Dilijan every hour, starting at 8:00 until 15:30. The ride is about 45 minutes and costs 500 AMD per person. The marshrutka you need will ultimately be heading to Ijevan (1000 AMD), so just let the driver know that you want to get off at Dilijan. You will be dropped at or near the roundabout that doubles as a bus station. We stayed at Art Guesthouse while in Dilijan, and hot damn we cannot recommend it more. This guesthouse is by far the cleanest, professional, well-run guesthouse we’ve encountered in our travels, and it was one of the cheapest options in Dilijan to sweeten the deal. You can book Art Guesthouse here. A beautiful lounge for feasts, movies, and shisha. The rooms all have actual heating units and come with private bathrooms, towels and toiletries. There are multiple outdoor pagoda sorts of things where you can chill, with friends or alone. There’s a barbecue, multiple kitchens, unlimited coffee and tea, an indoor chilling room with a feast table, pillows, a hookah with free shisha, and a projector for movies. Oh, and sweet mountain views. The guesthouse is a bit of an uphill walk from the center, and hard to find, but we assure you, it’s worth it. We paid 14,500 AMD a night for a private double, though prices may rise a bit in the high season. Green Garden Guesthouse: Run by a kind owner who freely shares his food and drinks, this is a relaxing place a bit out of the main town – Book Green Garden Guesthouse here. Areguna Guesthouse: Offers spacious rooms and a warm welcome. The homecooked food is delicious too – Book Areguna Guesthouse here. If you want to know more about other hikes in Dilijan National Park, check out this useful page about the Transcaucasian Trail. 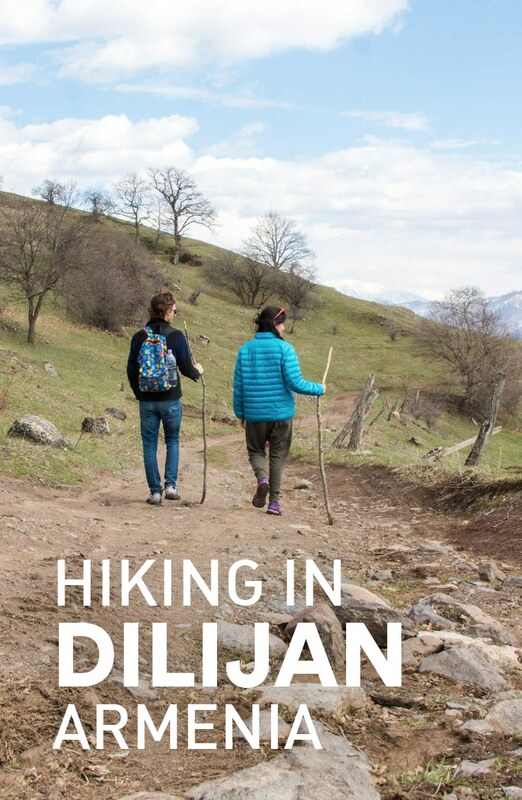 And there it is, a quick guide on hiking in Dilijan. Let us know in the comments if you have something to add.